Recently some of my riders have gotten good enough at posting that I’ve started teaching them posting on the correct diagonal. I learned by rising with the outside shoulder, however some of my riders have had a hard time with this method. So I did some research and here are the whats whys and hows I have discovered for teaching posting on the correct diagonal. Enjoy! When you introduce the concept to your riders, first review what posting is and how the horse trots with diagonal leg pairs. Perhaps ask them to explain these to you and supplement as needed. The Diagonal = when the horse trots, his legs move in diagonal pairs. The outside fore and inside hind are one pair, and the inside fore and outside hind are the other pair. The pairs take turns stepping, which makes the trot a two beat gait. Posting on the Correct Diagonal = posting with the diagonal pair that makes it easiest for you and your horse to balance. This means sitting when the inside hind is pushing, and rising when the inside hind is pushing and the outside fore is travelling forward. Posting on the correct diagonal helps your horse balance better through turns, because you are sitting when the inside hind is pushing on the ground, which is when that leg can best support your weight, and we rise when it is coming off the ground, so your horse can pick it up easier. It also feels better and makes posting easier! Helps the horse balance your weight in the turns. The hind legs are the pushing power of the horse. When turning, the outside legs travel farther. The inside legs take shorter steps and bear more weight. Therefore the inside hind is the main pushing power of the trot, and does the most work. So we want to help it out. When you post, sitting puts your weight on the horse, and rising takes your weight off him. So we want to sit when the horse can best support our weight. 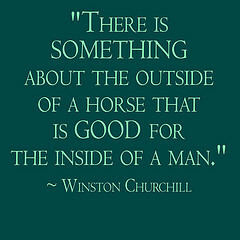 Therefore, we sit when the inside hind is on the ground pushing the horse forward so he can carry our weight, and we rise when the inside hind comes forward off the ground so he can pick it up easier. By supporting our weight better, he can balance better, and turn better. If you post on the opposite diagonal, you go against his natural balance and end up asking him to push his hips out, which disengages him, and makes it harder to balance. It’s easiest to apply the leg aids when we sit. Also, the horse’s impulsion or energy assists the rider with ease of posting. Applying the leg aid when the horse’s hoof is on the ground asks him to push harder with that leg. Applying the leg aid when the horse’s hoof is off the ground asks him to move that hoof over. To help him engage, sit so you can apply the leg aid when he is pushing with the inside hind (the power). Posting equally on both sides works both side of his body equally. When you trot for long distances you want to switch diagonal so the hind legs get an even workout. Sitting when he’s pushing with the inside means rising when the inside hind comes forward. Since he trots with diagonal legs pairs, this is also when the outside fore comes forward. Therefore we rise when the outside shoulder comes forward. We look to the outside shoulder because it takes a longer stride, so it’s easier to watch. We also look at it because we haven’t learned to feel the correct diagonal with our seat yet. What is the leg sequence for the walk? What is the leg sequence for the trot? Is impulsion (push) created by the hind legs or fore legs? Which hind legs steps farther on a circle? Which hind leg steps shorter on a circle, creating more pushing power? Is it easier to use your leg aids while sitting or rising? Which hind leg should you use your leg aid on to get more pushing power (engagement)? There are several teaching methods to identify the correct diagonal: by watching the forelegs, or by feeling the hindlegs. At the walk, tell them when the outside shoulder moves forward, and have them watch, so they learn what they are looking for. You say, “Now…now…now…” until they say they understand. At the walk, have them call out when the outside shoulder moves forward. “Now…now…now…” and help them until they consistently get it right. At the posting trot, have them look down and try to tell if they are rising when the outside shoulder goes forward. Give feedback until they consistently get it right. If they are posting on the wrong diagonal, teach them to sit a beat to switch to the correct one. Make sure they see the difference. As soon as possible teach them how to glance down quickly with only their eyes to see if they’re on the correct diagonal, instead of looking down for a long time, which throws off their balance. Practice getting on the correct diagonal within 3 steps. Start posting, check diagonal, sit a beat if needed. Lastly, ask them to change back and forth between the right and wrong diagonal to help develop a feel for which one is correct. Alternately, you can teach them to sit the trot first, watch the outside shoulder, then start rising with it, so they always start off on the correct diagonal. Remember, when you switch directions you may need to review the new inside/outside. Rise with the outside shoulder. Stand up when the outside shoulder goes forward. While the above method is the most common, for riders who have a hard time with it, this method is often easier. It worked for mine! Sit when the inside shoulder goes forward. Put a long piece of tape on each of the horse’s shoulders, or holiday bows. Put two different colored polo wraps on their horse’s legs, so they can see the color moving under them, and help see it on the other riders. Have them drop their fingers just enough to feel the shoulder moving. This method is similar to the first one, but from the beginning don’t tell them which diagonal is correct. Teach them how to see which leg they are rising with. Have them sit for a while and try to come up with the same leg. Have them sit for a while and try to come up with the other leg. Teach them how to sit a bit to change the diagonal. Or say “Now show me coming up with the other leg” and after a while they naturally learn to sit two times, and they’ll feel proud for figuring it out on their own. Have them ride with one hand on their thigh. This changes their balance enough to feel how posting on the correct diagonal makes it more comfortable. DON’T tell them which one to rise with, let them figure it out! Try posting on both, then ask “Which one do you like better?” If they have a hard time with this, make the circle smaller so they can feel it better. If the student has already learned to post watching the shoulder, tell them that while we remember our diagonals based on the front legs, we are actually posting in balance based on the back legs. At walk, have them feel their hips swinging side to side. You may want them to exaggerate the movement, or have them sit way back on their seat bones, to help them feel it better. Have them say “now” every time their outside hip lifts up. Tell them when it happens to help them know what they are looking for. Explain that when their hip lifts, that leg is stepping and pushing (when the hip drops, that leg is in the air and swinging through). At the sitting trot, have them try to feel the same lifting and rocking of their hips. Have them say “now” every time their outside hip lifts. Tell them when it happens to help them know what they are looking for. Explain that they need to start rising in the posting trot when that hip goes up. The hardest part is standing up at the right time. They need to start when that hip is about to rise, or notice when the outside hip drops and stand up on the next beat. For slower reacting riders, it may need to be even earlier timing, when that hip is rising the beat before. Have them try it until they get it. I hope the inspirational music starts when my riders succeed! Alternately, you can teach posting by feeling the inside hip drop, which perhaps is a little more true to the reason of posting to help the inside hind leg. When the inside hip drops, you need to be rising, and when the inside hip rises, you need to be sitting. However, “rise when your inside hip drops” might be harder for the rider to remember than “rise when your outside hip rises”. Remember, when you switch directions you may need to review the new side/hip to feel for. Lastly teach them how to check for themselves if they are on the correct diagonal by briefly glancing down at the shoulders. Have the rider close their eyes while posting the trot on a lunge line circle. Ask them to tell you if it feel like they are being thrown outward or staying more centered. Have them switch posting diagonals and ask again. The correct diagonal should feel more balanced. They may even feel a bump or lift under their inside thigh when they sit on the wrong diagonal that pushes them to the outside. Have the rider close their eyes while sitting the trot, or at least sit really deeply if not closing their eyes. Ask if they can feel the horse bounce them forward a little. When this happens, just start posting. Aka let the horse push you into not just the post, but the correct diagonal. Straight lines with a leader can help the rider focus on diagonals while not worrying about steering. Going one at a time on the rail allows you to have the students watch each other and try to tell if they are on the correct diagonal or not. If you trot on wall and walk the other, give them something to do on the walking wall that works toward the skill – such as posting walk, identify when the outside shoulder is forward by saying “now”, or have sidewalkers point out when the shoulder is forward, or duct tape colors on the horse’s shoulders, or do 2 point and identify when the shoulder is forward to feel it in their hands on the horse’s shoulders, etc. 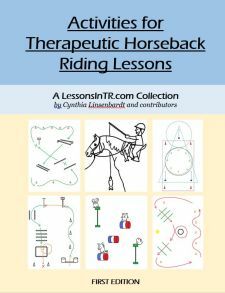 Riders that are good at steering while trotting may benefit from practicing diagonals on circles, such as trotting around a cone circle or on one half of the arena, as it highlights how posting on the correct diagonal helps them and the horse stay in balance while turning. Practicing on the lunge line can help the rider learn the correct diagonal by feel because the circle highlights the correct balance, they don’t have to worry about steering, and they can close their eyes to feel the motion better. Remove verbal and visual support. Progress from circles (easier to feel the right balance) to straight lines (may be more difficult to tell which shoulder is inside or outside, or remember which hip motion to feel for. Pick up the correct diagonal within three steps after the walk-trot transition, and if wrong self-correct on their own. Pick up the correct diagonal immediately. Did you notice if you were on the correct diagonal? How did you know? What is your favorite saying about posting? Why is posting on the correct diagonal important? What part of your body did you use most? At some point you may want to let them know that posting on the “correct” diagonal is not a firm rule. Sometimes riders post on the “incorrect” diagonal to influence the horse in other ways. If you need the horse to cross that inside hind leg over, such as in leg yield, you need to apply the leg aid when that inside hind is off the ground and he can actually move it over – also, it’s easier to apply the leg aids when sitting. Therefore you will sit when the inside hind is lifting and apply the aid, although it may be posting on the “incorrect” diagonal. How did you learn to post on the correct diagonal? How do you teach your riders? Julie Goonight. “The Importance of Posting on the Correct Diagonal” Barn Mice. The Importance of the Posting Trot August 4, 2014. Americas Horse Daily.